RBB Blog Police: Chi va piano va sano e va lontano. Sometimes in our blogging community things get a little out of hand. Sometimes there are posts that are basically weak or untrue. Sometimes we see bloggers attempting to grow little empires. has decided that we need to keep our community safe. They have taken steps to form a blogging police force. 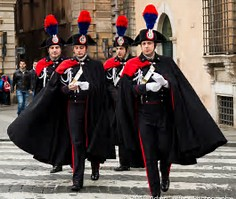 This police force will be modelled on the Italian Carabinieri and will be led by Capitano Riccardo Testore. Welcome Capitano Testore. It's good to know that you guys are on the job. Grazie Richard (of RBB). We willa doa a gooda job. We all know that The Carabinieri are corrupt, ineffectual and, well, Italian so I don't expect much to come from this. Of course THE WINE GUY INC. are above posting anything that is weak or untrue nor will THE WINE GUY INC. attempt to grow little empires. Just in case though, can I offer Capitano Testical a nice Valpolicella or a Chianti? No charge and of course no pressure or attempt to influence. Soma sorta ofa fish disha? Your offer was interesting until you said that. I love Italian wines (red not white) but haven't had one for a while. I find nowadays that red wines, particularly highly tannic ones like Italian, Spanish, French and some NZ and Australian Cabernet-based wines are a bit too much and keep me awake at night. If I see a good Italian wine, by-the-glass in a restaurant I'll buy it and try it but Murphy's Law says that if an 'exotic' wine is available by-the-glass then it is a cheap and crappy one. The Curmudgeon might need to offer Il Capitano some rispetto as well as wine if he wants to gain some influence with him. Risotto is nice. I cook a fairly decent one but it doesn't seem to me to be the sort of thing you offer someone. I mean, how do you present it? In a plastic bag? If you plate it up nicely do you get the plate back? No, I think it's a silly idea. I'll stick to giving wine as bribes. Mio Dio! Ara youa saying thata Adam anda Eva are whera ita starteda from?